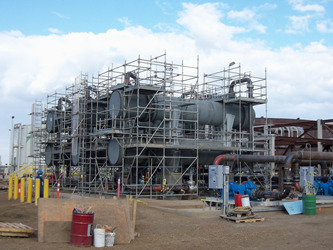 To support summer operations, the client needed to provide additional process cooling at a terminal located in their tank farm. 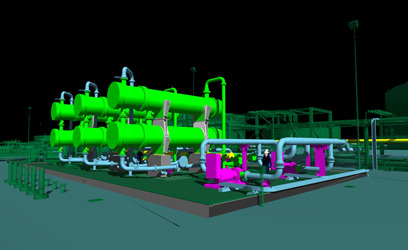 A temporary chiller system utilizing both surplus and rental equipment was proposed to provide the additional cooling. The project scope consisted of a series of heat exchangers from surplus equipment, installed on an existing concrete foundation. Piping tie-ins were required to connect one side to the process piping, and the other side to the cooling supply. (The cooling supply is provided from a rental equipment package consisting of chiller units and a Water / Ethylene Glycol cooling loop complete with pumps and storage tanks). The rental equipment package was to be installed on a new gravel pad foundation. The package also included electrical equipment (power panels and transformers) fed via rental diesel generators. The project included cable trays and cabling for approximately five (5) mega volt amp (MVA) of electrical equipment. Rally produced 13 construction work packages (CWPs) followed by 14 field change notices (FCNs) to support the construction of Tank Farm Temporary Chiller project. All the CWPs and FCNs were discipline-specific in order to simplify the scope for the field contractors. Rally provided construction coordination, field engineering / construction planning, and scheduling support.